In addition to performing attribution on standard portfolios of securities, FIA can also model subportfolio holdings in a natural and elegant way. Subportfolio modeling is an important capability that allows great flexibility in how you monitor your exposures and returns. While you do not have to use subportfolios to generate useful results, you may find them extremely useful in a range of situations. A managed fund holds half of all the issuance of a unit trust, and the manager needs an attribution report on the composite fund. A benchmark is made up of several sub-benchmarks. A manager may wish to show the subsector returns of a larger portfolio to show competence in managing a particular type of asset. A small group of securities is to be split out from a main portfolio and monitored. A synthetic instrument is set up as a group of other instruments. This synthetic instrument can then be treated as a discrete entity in its own right. All these cases can be modeled quickly and easily using FIA’s subportfolio capabilities. Diagram 2: A root portfolio and a subportfolio. STF1 is the root portfolio, and STF2 is the subportfolio. The reason for this message is that each portfolio passed to FIA must have be in the form of a tree structure with one – and only one- root portfolio. All other portfolios must be set up as subportfolios of that root portfolio. Since we have not told the system that STF2 is a subportfolio of STF1, the system thinks that you are trying to run attribution on two separate portfolios at the same time, and flags an error. STF2’s name is entered into the security name field. Normally, entering a security name that has not been set up in the security file generates an error. However, in this case the system knows that STF2 is actually another portfolio, and treats it as such. There is no need to set up a security called STF2 in the security file. STF1 holds one unit of portfolio STF2; in other words, the entire fund. No return is recorded for STF2. It is possible to record a return at this point (below we will show some cases in which you may wish to do this) but the system has all the information it needs to calculate the return of STF2 from its constituent securities, so there is no need to log this return. There are no limits on how many subportfolios can be held in a portfolio. 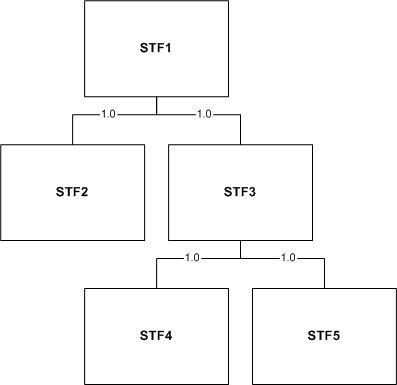 Here STF1 holds one unit of STF2 and STF3, while STF3 holds in turn one unit of STF4 and STF5. When fractional holdings are used, the contribution to performance from a subportfolio is adjusted by the fractional holding of that subportfolio. Excluding subportfolios, STF1 has a market value of $1mm, and a return of 1%, over a given month. STF2 has a market value of $0.5mm, and a return of 2% over the same month. STF1 has a 0.5 holding in STF2. Fractional holdings are accumulative. For instance, suppose STF1 holds 0.5 units of STF2, while STF2 holds 0.2 units of STF3. 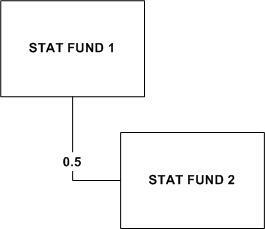 Then for STF1, the contributions to return by fund STF3 will be multiplied by 0.5*0.2 = 0.1. In this case, the contribution to return made by STF2 will drop on 31/1/2009 due to its lower holding. The topology of the fund can change over time. Suppose we have defined an interest rate swap as a portfolio containing a $1 holding of a bond, and a -$1 holding of an FRN. Rather than modeling the return of the swap as a set of holdings in both securities, FIA allows you to set up the swap as an independent portfolio in its own right, so that other portfolios can hold units of this synthetic security. Suppose that you want to monitor a particular trade, such as a barbell, in your main portfolio. A barbell position replicates the duration of a bullet bond by replacing it with two other securities, one with a long and one with a short maturity, so that the duration of the two securities is the same as the original bond, but the convexity is higher. The return of BARBELL will be shown in a separate report (see below) and the returns of the subportfolio will be shown as if it were a separate security in the main portfolio’s report. Usually, the returns field of a subportfolio can be left empty. However, there are some cases in which you may want to provide a specific return. In a previous section we showed how an interest rate swap may be modeled. Very probably, your back office has an official return for this security that should be used in the attribution report. It may well be that the official return differs to some degree from the return calculated by FIA. Whatever the reason, the official return will be used for all further attribution calculations, ensuring that the overall return of the portfolio is identical that that of the back office report. Since an official return is supplied for this synthetic security, a residual will also be calculated, and this can be monitored over time to flag any pricing problems (see Chapter 11, Residuals). Although STF2 is a subportfolio of STF1, its risk reports will be calculated as if it were a stand-alone portfolio. The summary risk report for STF1, and risk report by date and risk for STF1, will include the return contributions from STF2. The risk report for STF1 by date and security will show the return generated by each security that was held in STF1. In addition, the report will show the return generated by STF2 as if STF2 were a security in its own right. This includes return generated by any subportfolios of STF2, if they exist. Remember that the return contribution made by a sub-portfolio will almost certainly be different to its actual return. In general, risk reports are generated automatically for all sub-portfolios, but you are free to ignore and delete reports that are not of interest. A portfolio can only have one root portfolio. In practice, this also means that all links in a portfolio must be matched (no orphan portfolios). Disallowed: there are two root portfolios STF1, STF3. An attempt to run attribution on a portfolio with any of these issues will generate an error report, containing a clear description of where and why the problem occurred. At present, there is no facility to link different portfolio files together at runtime, but we may introduce this option in future. This page was last modified on 10 December 2011, at 08:11.